Ceramic luster glaze can take a piece from ordinary to extraordinary. Here’s some luster glaze tips to help you get the best results! Ceramic luster glaze is an overglaze that comes in a variety of finishes (including gold, silver, platinum, and mother of pearl). 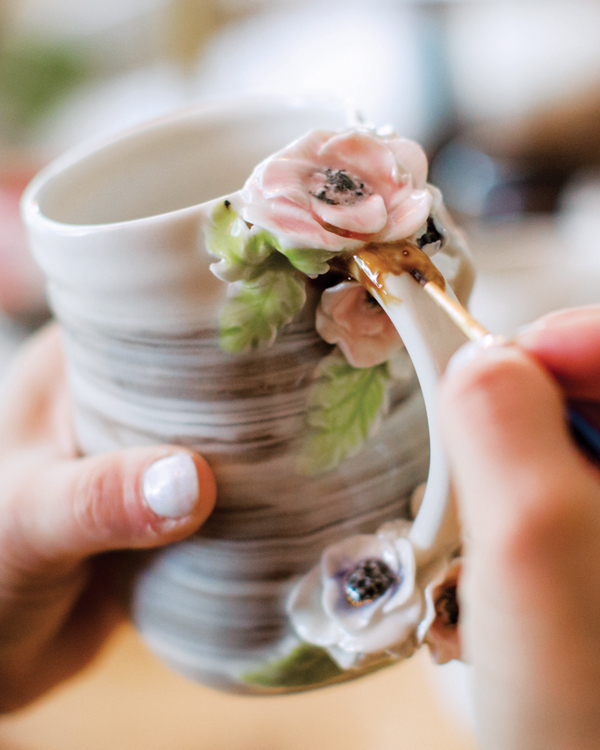 As an overglaze, it is applied to an already glazed and fired surface, and is then fired again to permanently affix it to a piece (for more, check out this post on overglaze enamels!). Seems straightforward enough, but there are definitely important tips you need know before working with ceramic luster glazes. In today’s post, an excerpt from the September/October 2018 issue of Pottery Making Illustrated, Marianne Tolosa shares safety advice and application tips to help you get the most out of ceramic luster glaze in the safest way! – Jennifer Poellot Harnetty, editor. PS. To learn more about ceramic luster glaze, including troubleshooting tips, check out the September/October 2018 issue of Pottery Making Illustrated. As a ceramic artist who adds gold luster to every piece I fire, the most common emails I receive from other potters contain questions about how to use gold luster. Generally, it seems like there’s a bit of trepidation involved, so if you’re curious about gold luster, but unsure where to begin, help is here! Use a properly fitted respirator that blocks fumes during application (1), and work in a ventilated space with plenty of airflow. Ceramic luster glaze has toxic fumes when it’s in liquid form. As long as the weather is nice, I apply my luster outside. 1 Research manufacturers to find your favorite luster and check with various suppliers to see if they offer a bulk discount. 2 Apply luster with a small, round brushes (created for oil paint), which are great for detail and provide smooth, even coverage. You can apply luster too thick or too thin (2). If the luster is applied too thickly on horizontal surfaces, you don’t see much of a difference, although you may end up with the occasional crack or bubble in its finish. When applied too thickly to a vertical surface, however, it does drip. I personally love when it drips. I find it to be luscious and rich in appearance, and I often intentionally add a thick dollop of it to the base of my handles or on the tip of a flower so it will run down the pot. On the other hand, if it’s applied too thinly, it will appear dark purple and/or streaked instead of gold. This is a problem on both horizontal and vertical surfaces. If this happens, you can add a little more luster to the area and fire the piece again. A final consideration when deciding how and where to apply your ceramic luster glaze is the surface quality of your piece. Gold luster takes on the surface properties of whatever you put it on. This means that if you use it on a shiny surface, it will be shiny. If you use it over a matte glaze it will be matte; and if you use it on a smooth surface it will be smooth. For example, if I want to coat the leaves of a flower with gold luster (3), even if I can see the texture of the leaf through the glaze (either because the glaze is transparent or because it breaks over edges), I need to make sure that the texture is actually tactile instead of smooth (in other words, I can feel the texture through the glaze) before painting the leaf with gold. Otherwise I’ll just end up with an opaque, leaf-shaped gold splotch on my mug instead of a golden, textured leaf. 3 Occasionally wiping your brush down with a clean paper towel minimizes mistakes created by excess luster on your fingers. 4 Always wear a properly fitted respirator (ideally with cartridges designed to block fumes) when working with unfired luster. When firing, make sure that your kiln is either isolated away from your living/work space and/or you have an adequate kiln exhaust system. The first time I fired a luster kiln, I didn’t realize that the fumes from my kiln were leaving the garage and wafting back into our living room window until it was too late, and I ended up with a headache. I fire gold luster to cone 018 in my manual electric kiln. When I was first using lusters, someone recommended that I should apply my gold and let it dry for 24 hours before firing it. However, I can be impatient, so now I tend to add pieces to my kiln as I apply the gold to them, shut the lid when I’m finished, and crank it up to high. It only takes 2–3 hours for my kiln to get up to temperature, and another 4 hours to cool. I’m not necessarily recommending that you do it this way, but I’ve never personally had any issues with it. I work with a cone 6 porcelain from Kentucky Mudworks called White Lightening, which stands up to my procedure beautifully, but you may need to be more patient and slow the process down a bit depending on your clay body and the size or thickness of your work. Do you have any tips for working with luster? Tell us in the comments! ceramic luster glaze, clay, glaze firing, overglaze, porcelain. In addition to the respirator that is recommended in this article, I would suggest the use of a spray booth or even an overhead kiln ventilation hood. You can never be too safe with the toxic chemical fumes in ceramic lustres.